Hello! 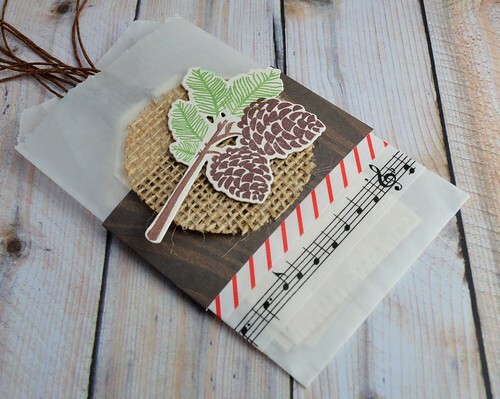 I have to admit, I almost decided not to play along with the PTI October Blog Hop Tag It Challenge but decided at the last minute to create a CAS set of tags with a coordinating gift package. I used one of my favorite PTI sets "Peaceful Pinecones" and matching die set. I also used the PTI sentiment set "Happiest Of Holidays". It took no time at all to create this set! Thank you for stopping by, and I will try and visit as many of you today as I can! Have a great day and happy hopping! Love the tags and gift bag! i just bought Peaceful Pinecones last month and I think it's my now my favourite holiday set. These are LOVELY!! That bag you made is so CUTE too! Love these! Great CAS tags and the little bags are sweet. 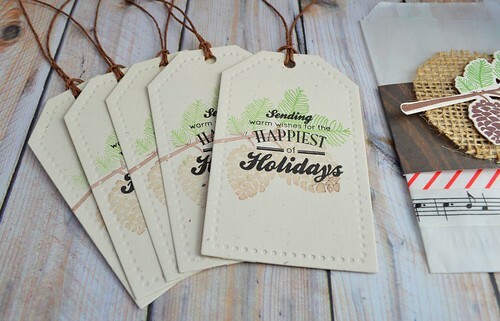 Great tags - love the soft colors! Super sweet tags, love that set. Oh, these are so lovely, Veronica! And I love the sleeves you made for them, too! Beautiful tags! And their coordinating bags are perfect! What a lovely little gift set. Fun With Dies - And a Challenge! Playing Along With Dynamic Duos! Fall Flowers And A Challenge Or Two! Happy World Card Making Day - A Trio Of Cards!